When Patrick Dragonette was assigned his “Room without a View” for Maison de Luxe, he thought about what kind of room he would like to have. Knowing that it was originally a guest suite, he thought it could be interesting to create a space where you could have a bit of fun in such a formal house. 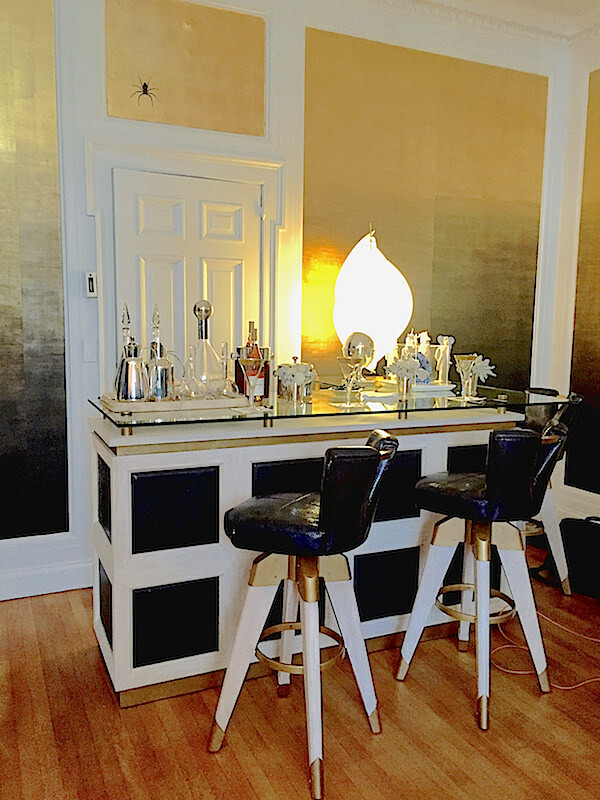 It all started with “wouldn’t it be great if we could get a ping pong table.” Showhouse sponsor Caesarstone was immediately on board with the idea and built one for Patrick with their new Vanilla Noir product. Behind the table, below, are silver prints of xray bulbs from a 1930’s Hollywood photographer represented at mptv that Patrick had printed oversized as a triptych. 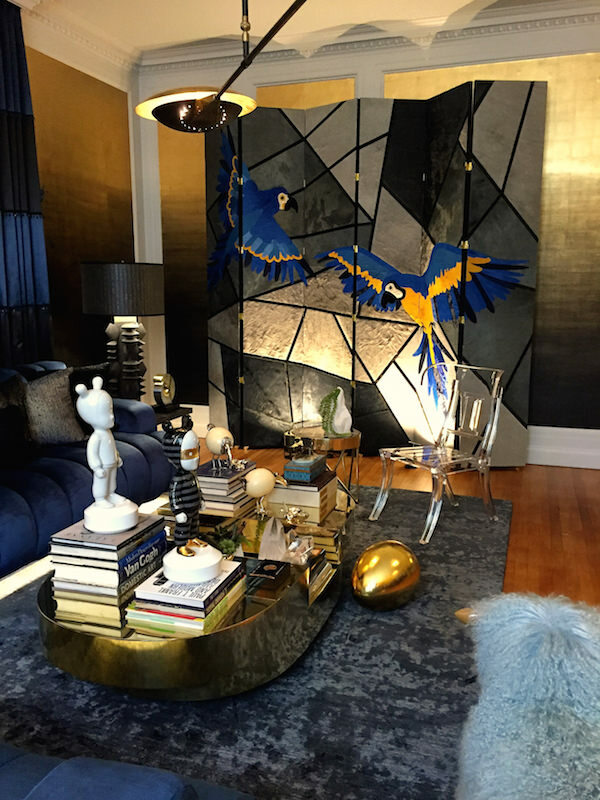 Their bold graphic imagery is the perfect style statement for the space. Patrick had always wanted to do an ombré on the walls from black to gold leaf and found a partner in Fromental who “shared my vision and weren’t the least bit thrown when I asked if we could add a few bugs etc. here and there.” The walls envelop the room with just the right combination of glamour and hint of dark macabre. It somehow didn’t seem a large leap from ping pong table to bar and bar stools. So when Bausman & Company, also a sponsor, offered to build Patrick’s concept, everything started to fall into place. 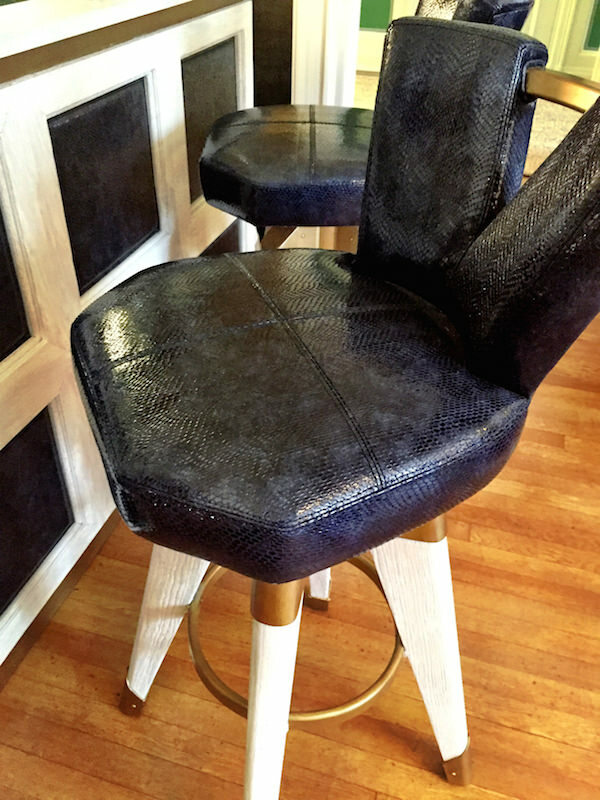 In a base of cerused oak with gold metal trim are panels of navy python printed patent leather, with which the stools are also upholstered. Weeks earlier, after Patrick had committed to doing the showhouse, he had been in Paris. In the Hermès store, he had seen a striking lacquer charger that was black with an ombré to a deep blue that became the inspiration for the palette. The sofa and chair are Steve Chase designs from the early 80’s, that Patrick has had in storage for quite some time, just waiting for just the right place to re-envision. Sponsor Duralee had the perfect blue for them and additionally just the right fabric for the drapery. A beautiful Fort Street Studio rug completes the color story with fabulous new light fixtures from Downtown grounding the room. Patrick added “As the room was taking shape I had to accept that our cocktail table, a rare and unique brass table by famed Italian designer Gabriella Crespi, would be gone for some time as it was the perfect choice for the space.” And uniting color, texture and pattern is a bold and beautiful hide screen, designed by Patrick and executed by Kyle Bunting. Truly a testament to creative collaboration. On either side of the sofa are table lights with a back story of another creative endeavor. Last February at the Palm Springs Modernism show, Patrick met ceramic artist Titia Estes who had a small vase with fins that Patrick immediately envisioned as a lamp. They produced that together and when Titia subsequently sent Patrick a photo of another vase, hand built of Cassius black clay, he knew an enlarged version “on steroids,” enhanced, à la Billy Haines, with gold leafed tops and bottoms, would be perfect for the showhouse. And while there isn’t enough room to single out every piece in the room, sculptor Onik Agaronyan certainly deserves a shout out. A lifelong collector, he has bought and sold art since a teenager, but it wasn’t until he started seriously creating his own work, that he quickly attracted the attention of those in the know, including the owners of Downtown, who carry his work, and Patrick. Fascinated for years with the symbolism of power and death, Agaronyan juxtaposes “the transitory nature of life with the permanence of passing, confronting us with the reality that all the glories of achievement are temporary.” Patrick knew Agaronyan’s luxe and dark vision would the perfect addition to his room. 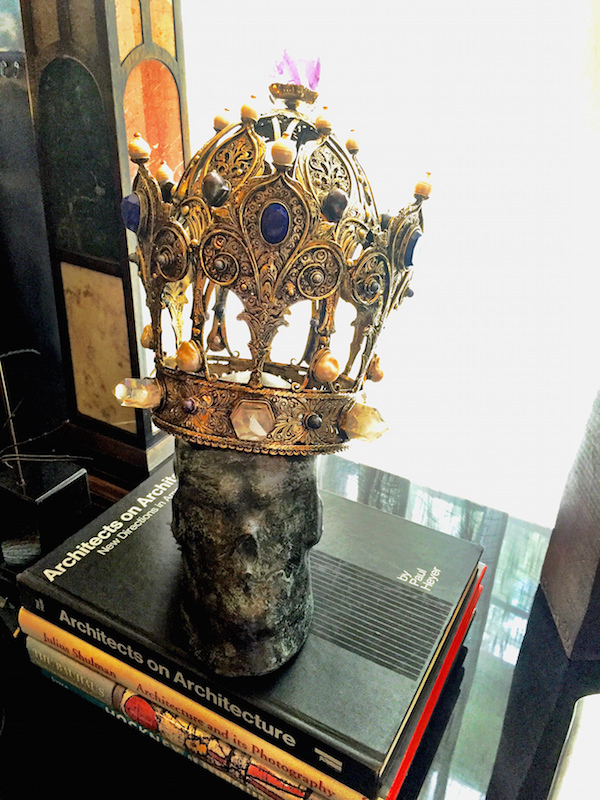 Agaronyan selected one of his distinctive Skull and Crown series to complement the black and blue color scheme. Kudos to Patrick for his fearless design and passion for creative collaboration, proving a room with no view can still be a very glamorous and special place. This entry posted in art, design, furniture, interior design, travel. 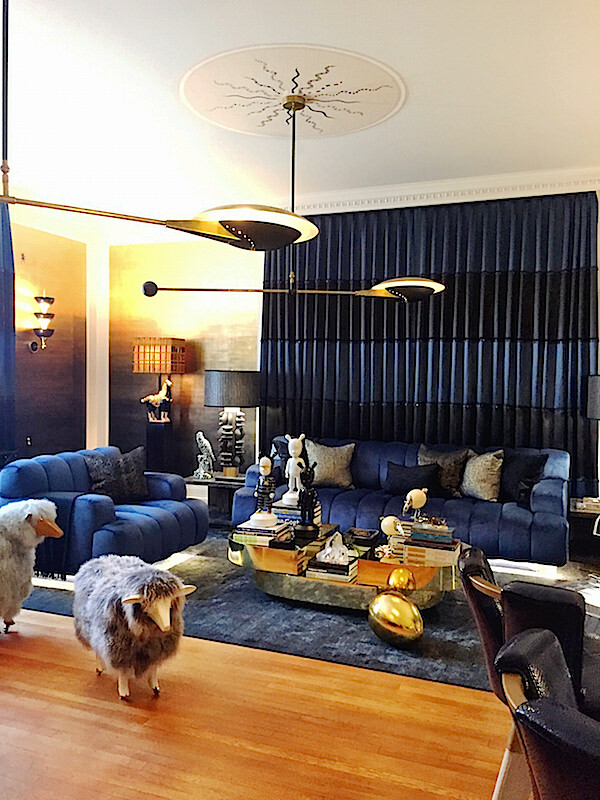 Entry Tags: designer showhouse, Dragonette Ltd, interior design, Maison de Luxe, Patrick Dragonette Bookmark the permalink. Absolutely F A B U L O U S!!!!!!!!!!!!!!!! Wow. So wonderfully executed. As always, thank you for all of the details, Stacey. i adore those bar stools! And the ping pong table and Agaronyan’s sculpture. love understanding how he pulls it all together. Patrick is FABULOUS…for years I’ve known him, bought from him. I’ve watched him grow, from a small shop dealer to a decorator par excellence. He has a natural yearning for learning, he never pontificates – a sign that a person isn’t willing to listen to another nor learn something new. When it comes to William ‘Billy’ Haines, there really is no one else who deals in true provenanced Haines other than an auction house. This room is sumptuous, and though it’s Modernism is not in keeping with the exterior architecture, it is really a match for the stylized Art Deco period that raged in the 1930s, that special Golden Age of Hollywood Glamour which burned brightly thanks to Cedric Gibbons and others…which Patrick Dragonette is an acolyte…he took a room without much and created a stage worthy of Harlow and Gable! Very stunning and dramatic, the materials are so luxe! Sheer glamour in the hands of a consummate professional. Patrick’s historical knowledge and penchant for Hollywood glamour are translated into this amazing room for Maison de Luxe. How masterfully he has created the feeling of sunshine and shadow in a room with no view! Bringing the outdoors in with bugs and animals is another inspired approach to make one forget that one is cut off from nature! And there’s even room to play and be active with ping pong. Why ever leave?! Brilliant! What fun and unexpected room! That ping pong table is unbelievable and we’d never leave the bar sitting in those chairs. 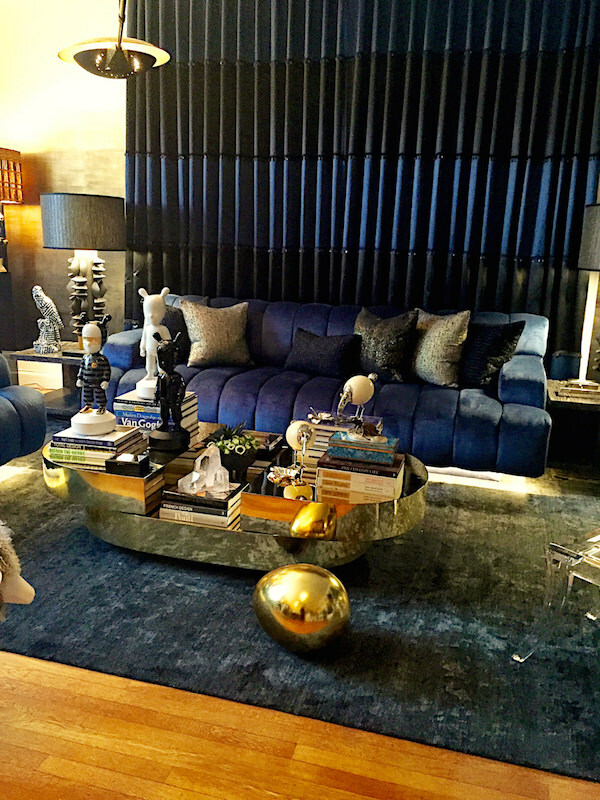 Did you see our succulents and orchids in Nina Campbell’s room? Patrick’s room really drew in huge crowds during the entire stretch of the grand opening evening! 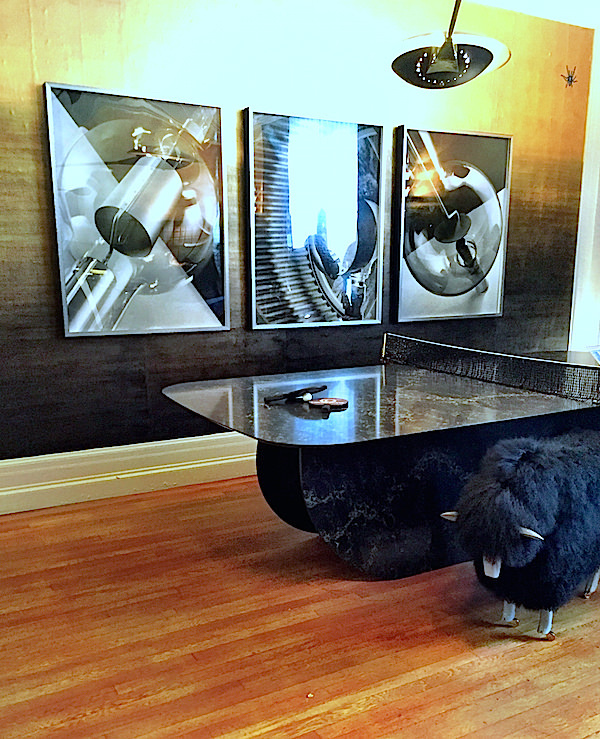 It was a tremendous honor and previledge for Bausman to have been asked by Patrick to create his extraordinary vision for a “Gentleman’s bar and bar stools”, at the last ever Grey stone mansion showcase house – Mason de LUXE. 80 queries in 0.658 seconds.